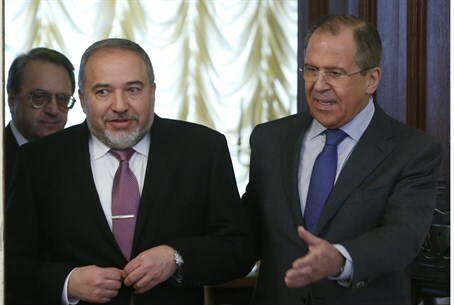 At a meeting with Russian FM Sergey Lavrov, Avigdor Liberman discussed regional issues including Iran, Syria, and the PA.
Foreign Minister Avigdor Liberman met with his Russian counterpart Foreign Minister Sergey Lavrov in Moscow Monday. At the meeting, the two ministers discussed the continuing and strengthening of relations and cooperation between Israel and Russia. The pair also signed a memorandum of understanding between the two countries' foreign ministries. Liberman and Lavrov focused particularly on issues regarding the wider Middle East - particularly what is happening in Syria and Lebanon. Liberman made clear Israel's positions and red lines when it comes to what happens around its northern border. Speaking about the Iranian nuclear issue and continued negotiations (which his country is a part of), Lavrov stressed that any solution must not be made at the risk of other countries in the region. “We are convinced that only a political diplomatic solution to the issue is possible. We categorically insist that the problem is solved so as not to create any risks or threats to security of countries in the region, including of course Israel,” he said. Liberman noted in response that Israel has so far seen no solution agreeable to everyone. “In regards to the Iranian issue, we are following the 5+1 and Iran talks very closely. Our approach is that it’s better to have no agreement than a bad one. So far we don’t see a good agreement that would suit everyone,” he said. Israel's Foreign Minister added that his country was keeping all options on the table. Liberman then addressed the Palestinian Authority's joining of the International Criminal Court in The Hague and the ICC's probe into so-called "Israeli war-crimes." He stated that Russia, like other countries, should understand that the PA's use of ICC as a tool for political bashing is not only unjustifiable, but will also eventually hurt Russia (and other nations) as well. Liberman and Lavrov concluded the meeting with a discussion of a host of bilateral issues, including pensions for the elderly, visiting lecturers from both countries, and other Consular issues. On the topic of pensions, Liberman noted it was especially important to resolve the matter now, particularly for Holocaust survivors, as the world approaches the 70th anniversary of the victory over the Nazis during World War II.